I have a Begonia plant that I have only seen once before, and would like to know what it is called. 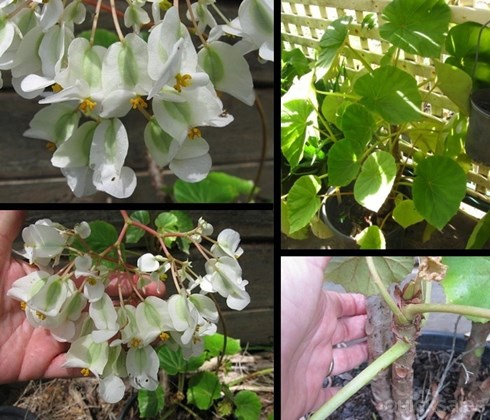 My plant is on a tall thick stem, about a metre high and thick as a broomstick, it has large leaves, like small dinner plates with white flowers. I would like to know if I can take a cutting and try to grow it. It looks like a Tree Begonia - there are many cultivars and leaves can vary, say with spots or red/brown underneath. 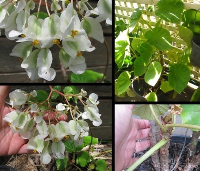 Google "White Tree Begonia", and you may be able to identify it by the leaves. I have many different tree Begonias that have been grown from cuttings. Some people even grow them from leaf cuttings. Try a short stem piece in sandy soil in a small pot in a shady greenhouse and water gently every couple of days. Thanks Pam, I have called it a tree Begonia myself, it is a very tough plant, and have taken your advice and googled it. It does not appear to have a cane, as I have other cane Begonias and also some Rhizome type Begonias. This tree Begonia seems to have more of a trunk and the flowers stand upright. One thing I did learn after searching for it on the internet, is that an indicator for sun or shade growing requirement - if the underside of the leaf is darker than the top of the leaf - it requires shade, and if green underside then it can take more sunlight. Thank you I have cut off a section and potted it up, and I will keep my fingers crossed.